In my book Electric Bass: Improve Your Groove there’s an entire chapter about playing with drummers. If you want to improve your timing and your time feel on bass, then practising subdivisions with a drummer is a great way to go about it. Here’s a video featuring my good friend Lewis Davies on drums to show you how I do it. It’s important to understand that a band grooves and not just an individual. So, if you want to improve your groove, it’s essential to practice with other musicians and not just on your own. The best place to start is by practicing with a drummer. Practice placing your notes accurately on the subdivisions that the drummer plays, and you will begin to develop the collective time feel that you need for a band to groove. It’s important to understand that virtually all music uses just a small number of subdivisions. Eighth note, sixteenth note, and triplet feels occur in virtually all styles and genres of music. 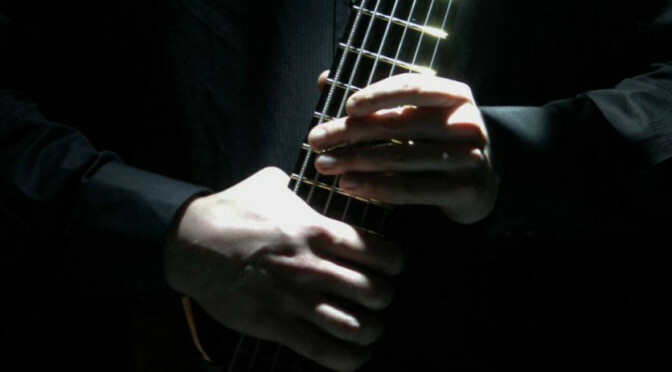 If you want to have a great time feel on bass, it’s essential to not only understand them, but also to be able to execute playing them accurately. That is the premise of my book Improve Your Groove. This post is not so much about understanding them, but more about how to play them better. If you want to understand subdivisions better, you could buy the book, or you could check out this post called Rhythmic Subdivisions on Bass Guitar. When I talk about an eighth note feel, what I mean is that eighth notes are the smallest subdivision in the bassline. Therefore, in order to make the bassline groove you must feel the eighth notes running through the music. All of the eighth notes, not just the ones that you play on. Here are the two eighth note bass lines that are featured in the video. When you play a shuffle feel, the smallest subdivision is a triplet. Typically in a shuffle, you create a different kind of off-beat to the straight eighth note feel, by playing just the first and third triplet subdivisions in each beat. As I explained in the video, if you recite Ta-Ki-Ta for your triplets, and only play on the two Ta syllables, you get a shuffle feel. This shuffle bass line is fairly advanced and it adds a few passing notes on the second subdivisions. But, it still retains the feel of a shuffle and Lewis is playing a shuffle on the drums. The following example shows how you can change the feel whilst still using a triplet subdivision by accenting the second subdivision. It’s important to understand that a sixteenth note feel does not necessarily mean that you have to play more or faster just because there are more subdivisions. It just means that in order to get the feel right, you need to feel the sixteenth notes in the music, Ta-Ka-Di-Mi. Here is an example of a bassline with a sixteenth note feel that doesn’t contain lots of notes or any fast passages. For me, the most interesting aspect of a sixteenth note feel is the expanded rhythmic potential that sixteen subdivisions in each bar offers. Which is why we bass players love to improvise bass lines with a sixteenth note feel. There are so many potential rhythmic variations out there. And as long as you accurately place the notes onto the subdivisions, then you can’t really go wrong. Here is an example of a more advanced, syncopated sixteenth note bass groove. All you need to do is make sure that your notes land on the drummers subdivisions. If you can’t practice with a real drummer, then practice with a drum beat backing track. But there’s no substitute for the real thing if you can find a drummer to practice with. It’s always a good idea to record yourself if you can, and listen back. It doesn’t have to be amazing sound quality, just enough so you can hear how accurately you’re placing your notes. And don’t worry if you feel like you’re not very good. Learn together with a drummer and improve together over time. Lewis and I have been playing together since we were teenagers. And I think we’ve learned a lot both together and separately since then. In this video lesson you’ll learn all about sixteenth note bass grooves. How they differ from eighth note grooves and some practical advice for practising them. What’s the difference between eighth and sixteenth note feels? I explained in Part 1 of this lesson that when you divide a beat into two, you get an eighth note feel. If you divide each beat and each off-beat into two, so that each beat is divided into four, then you will have a sixteenth note feel. When you play eighth note grooves, you can place notes either on the beat or off the beat. On Ta or on Ka. When playing sixteenth note grooves you can still place notes on the beat, but there are now three different places where you can place notes off the beat. There is still a conventional off-beat, as there was with eighth note grooves. This is the point in time exactly equally distant from the beat before and the beat after. However, there are now two other sub-divisions. The first comes between the beat and the off-beat, and the second comes after the off-beat. All four sixteenth note sub-divisions must be equal. None of them is longer or shorter than the others. Learn to feel all four sixteenth note sub-divisions individually. In Part 1 I explained that in order to groove in an eighth note feel, you must feel the beats and the off-beats. So if you want to groove while playing a sixteenth note feel, then you must also feel the other two sixteenth note sub-divisions. And, to have great timing you should be able to accurately place a single note on any sixteenth note sub-divisions. Each of the four sub-divisions has it’s own unique feel when you place a single note on it. Just as the beat has a very distinct feel from the off-beat. So the other two sixteenth note sub-divisions have their own distinct feel. How do I improve my sixteenth note groove? First you need four syllables to represent the four sixteenth note sub-divisions, Ta-Ka-Di-Mi. I used Ta-Ka to represent the beat and off-beat in eighth note grooves. For sixteenth note grooves Ta is the beat, Di is now the off-beat and Ka and Mi represent the additional sixteenth note sub-divisions. As with eighth note grooves, the key to having great timing is the ability to place a single note very accurately onto a sub-division. If fact that is the key to having great timing no matter what the feel or style of music. So begin by trying the exercise demonstrated in the video. Say Ta-Ka-Di-Mi, making sure you say it in time, with every syllable equal in length. Use a metronome or drum beat to help if you need to. Then try playing a single note on each of the four syllables. First Ta, then Ka, then Di, then Mi. This should help you to experience the different feels of the four sub-division. Once you’ve done that, try playing this sixteenth note example from the video slowly. Try reciting Ta-Ka-Di-Mi while you play it, as I’ve demonstrated in the video. Play it as slowly as you need to in order to place all of the notes accurately. Once you can do that, try gradually increasing the tempo. Don’t try playing the example fast until you’ve mastered it slowly. A good rule of thumb to remember is this. If you can’t play something in time slowly, your time feel won’t be good when you play faster. I’ve often heard students say that it’s harder to play something slow than fast. It can often feel that way. The reason is that playing something slowly makes all of the little errors of timing very obvious. They’re not so obvious when you play fast. However, if you want to improve your groove, you need to get rid of those little timing errors. Those notes that are placed slightly before or after the sub-division they were meant to be on. And that involves playing very accurately slowly, and then gradually speeding up while maintaining the same levels of accuracy. That’s how you improve your bass groove! 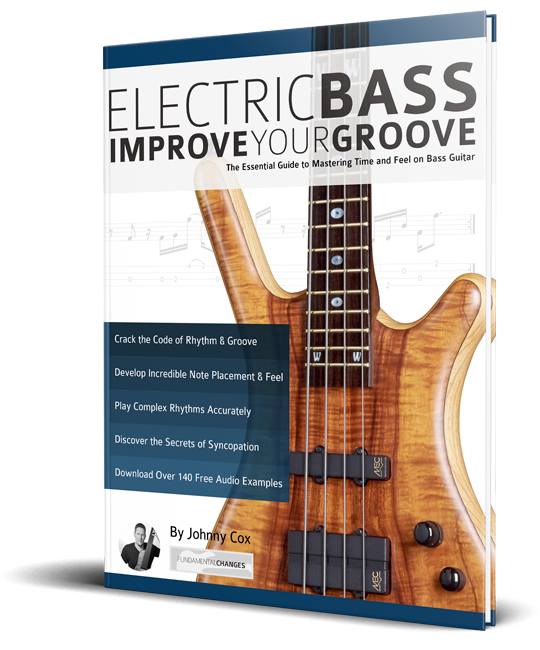 All of the examples in this series of videos come from my book Electric Bass – Improve Your Groove: The Essential Guide to Mastering Time and Feel on Bass Guitar. Click on the link to find the book. https://geni.us/bassgroove. The book contains over 140 audio examples featuring eighth and sixteenth note grooves in a variety of styles including rock, blues, jazz and latin. It also features sections on syncopation, shuffle feels, triplets and swing. It has practical advice for grooving with drums and sharing a collective time feel in a group. And it features five pieces with play along backing tracks to help you put these ideas into practice. This is an important topic for bass players because most music has either an eighth note or sixteenth note feel. So, every bass player should know when and how to use eighth and sixteenth notes. What are they and how do I master them on bass? In this video lesson I’ll demonstrate the difference between bass lines with an eighth and a sixteenth note feel. Then, I’ll explain how to improve your rhythmic accuracy when playing these feels so that you will improve your groove. 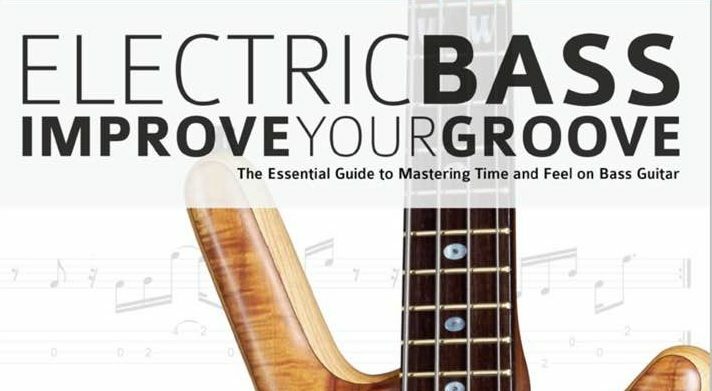 First have a look at these two examples from my book Electric Bass – Improve Your Groove: The Essential Guide to Mastering Time and Feel on Bass Guitar. Find the book by following this link. Listen to both examples either by watching the video or by using the Mp3 audio tracks that accompany the book. It’s so important to listen to the examples as well as reading them. If you only read them without listening then you’re only getting half the story. The first thing that I want you to notice about these examples is that they’re quite similar. The speed and chord progression are the same and they contain mostly the same notes. I deliberately wrote them that way because I wanted the only difference to be the rhythmic feel. The first example has an eighth note feel and the second has a sixteenth note feel. What is an eighth note feel? An eighth note feel means that every beat is divided into two. So each beat contains a beat and an off-beat. The off-beat is the point in time exactly equally distant from the beat before and the beat after. The eighth note example above has four beats in each bar so there are four beats and four off-beats in each bar. Therefore there are eight different places in each bar where you can place a note either on the beat or off the beat. Hence it is called an eighth note feel. It can only be called an eighth note feel if all the notes are placed on either beats or off-beats. If a note is placed on any other sub-division then it’s no longer an eighth note feel. An eighth note feel does not mean that you have to play eight notes in every bar on all of the eight sub-divisions. It means that all of the notes that you play are placed on either beats or off-beats. How do I improve my eighth note groove? In most cases when you’re playing an eighth note feel, you’ll play with an eighth note drum beat. Meaning that the drums are playing the eighth note sub-division. If you want your bass line to groove you need to make sure your notes sit very accurately in time with the drummers sub-divisions. However, you should also be able to groove playing eighth notes even when you’re not playing with a drum beat. In order to improve your eighth note grooves you need to have a system for feeling the eighth note sub-division when you play. My system involves using the syllables Ta-Ka. Using this system Ta represents the beat and Ka represents the off-beat. Recite Ta-Ka four times making sure that every syllable has equal length, Ta-Ka / Ta-Ka / Ta-Ka / Ta-Ka. This represents one bar of eighth notes. Four Ta‘s represent the four beats and four Ka‘s represent the four off-beats. Try reciting the Ta-Ka‘s in time with the audio example in the video (you’ll find it at 1m52s). If you can do that and keep it in time, then you are feeling the eighth note sub-division. How should I practise to improve my eighth note feel? You will improve your eighth note bass grooves by playing off-beats very accurately. I hear a lot of bass players who play on the beat very well, but they seem to guess where the off-beat is. They play it either too early or too late. The key to having great timing is the ability to place a single note very accurately onto a sub-division. Practise this by first placing a note just on the beats (Ta‘s) and then just on the off-beats (Ka‘s). I’ve demonstrated this in the video. If you’re struggling to keep in time while you do this, make sure you practise it slowly in time with either a metronome or drum beat. In order to play eighth note grooves really well, you first need to feel the beats and the off-beats and you need to be aware of which notes land on the beats and which land on the off-beats. Then you need to make sure that the notes on the beats land perfectly on the Ta syllables and the notes on the off-beats land perfectly on the Ka syllables. If you do that, your bass groove will be superb when playing eighth notes either with or without a drum beat. What About Sixteenth Note Grooves? Please continue to Part 2 of this lesson, you can find it using the link below. 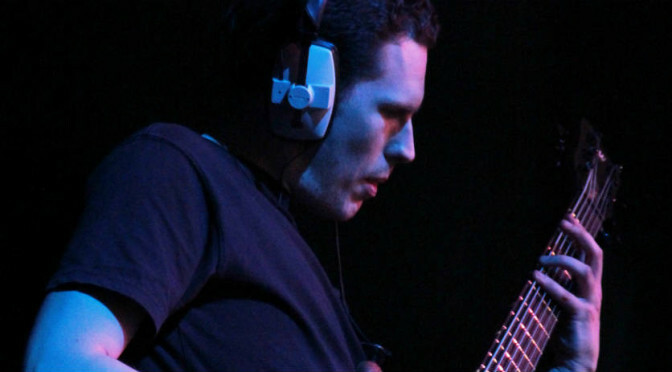 In Part 2 you will learn everything you need to know about sixteenth note bass grooves. A year ago I decided to start documenting my bass practice by picking one thing that I was working each week and making a short video about it. As a music teacher, I believe that if you want to keep improving your musicianship, then it’s essential that you keep finding new things to practice. It seems to me that a lot of people get stuck in the same practice routines, practicing the same things. And then they wonder why their playing isn’t progressing in the way that they want it to. What I’m trying to show, is that there is an almost unlimited number of different things to practice. And many different ways that you can practice them. I release the videos every Tuesday. And I haven’t missed a week in the whole year. So there are currently over 50 videos. All available for free without subscription. Jazz musicians love to play on dominant 7th chords. And the altered scale is a really important scale to practice if you want to create a jazz sound when playing on these 7th chords. I think that using the altered scale is often perceived as “advanced” harmony. But, as with most things, it’s easy when you understand it. So, here’s my very quick guide to using the altered scale on bass. What is the altered scale? The altered scale is a mode of the melodic minor scale. Meaning that it contains all of the same intervals as a melodic minor scale. The altered scale is essentially what you get when you play a melodic minor scale starting finishing on the 7th note of the scale. So, what’s a melodic minor scale? It’s basically only one note different from a major scale. If you take a major scale and change the major 3rd to a minor 3rd, you have a melodic minor scale. Here’s the notes of an F major scale. And here are the notes of an F melodic minor scale. Notice that the only difference is the third note. It’s an A natural in the major scale and an Ab in the melodic minor. If you play the notes of an F melodic minor scale but use E (the 7th note) as the root note. You would be playing an E altered scale. When you think about the notes of the F melodic minor with an E as the root note, it creates these interval relationships to the root note. The 3rd of E7 would, of course, be written as G# not Ab. But the altered scale creates some interesting theoretical anomalies like that. Because the major 3rd note (Ab/G#) is actually the 4th note of the scale. How do you use the altered scale? As I mentioned at the start, the altered scale works really well on dominant 7th chords. You can think of the altered scale as being a kind of extended dominant 7th arpeggio with lots of chromatic alterations. The scale includes the root, major 3rd and dominant 7th notes which are the fundamental ingredients of a dominant 7th arpeggio. But the other four notes are all chromatic alterations of some kind. Hence why it’s called the altered scale. You can alter chord tones and extensions by moving them one semi-tone up or down. The 5th of E7 is B natural, but in the altered scale the 5th has been flattened to Bb. So the altered scale could be used on an E7b5 chord. The 9th can be altered by sharpening or flattening it. The altered scale uses both alterations. So you could use it on an E7b9 or an E7#9 chord. The final alteration is a b13. So you can use the altered scale to play on any of these altered dominant chord types. And you will sometimes see the chord symbol E7alt. Which implies a chord that could include any or all of these alterations. So if you want to start using this altered dominant sound on your dominant 7th chords. Then start to think about using a melodic minor scale that starts one semi-tone above the root of the chord. So, if you’re playing on a D7 chord, think Eb melodic minor. For A7, thing Bb melodic minor, for G7 think Ab melodic minor, for B7 think C melodic minor etc. For another great jazz approach to playing on dominant 7th chords, check out my video guide to using diminished scale on bass. Last week I posted a video of me practicing improvising on Giant Steps chord changes on fretless and fretted bass. So this week I want to talk a bit about my approach to playing on what are some of the most notoriously difficult chords changes in jazz. Having said that, I don’t think that soloing on Giant Steps needs to be very difficult. As long as you start slowly and focus on internalising the sound of the chords before you increase the tempo. One of the reasons that John Coltrane’s Giant Steps has it’s fearsome reputation is because of the chord changes in the first two bars. The first bar starts on a Bmaj7 chord for two beats and immediately changes to a D7 chord on beat three. Which is a key change to G major. The second bar starts with a resolution to a Gmaj7 chord. Then it changes key again. This time to Bb7 on beat three which is the fifth of Eb major. So the tune starts with three different keys in two bars. Needless to say, if you’re not prepared for it, it will catch you out. And many Giant Steps solos have failed before they’ve begun because musicians can’t negotiate these quick key changes quickly enough. This chord movement in bars 1 and 2 repeats itself in bars 5 and 6 but transposed so that the progression starts on Gmaj7. And it’s this chord progression that defines Giant Steps. So if you want to improvise on Giant Steps you need to spend some time really working on this two bar chord progression. My first piece of advice would be to come up with lines over this two bar progression using chord tones. The progression itself is already complex enough on it’s own that you don’t need to add lots of chromaticism or substitutions to make your lines sound interesting. It’s amazing how many interesting sounding jazz lines you can come up with on Giant Steps using nothing but roots, 3rds, 5ths and 7ths. Here are three different lines that I came up with which use nothing but chord tones. You can transpose each of these to work over bars 5 and 6. But here’s another one that I wrote specifically to be played over bars 5-7. I don’t work out these licks so that I can play them in a solo. I do it to help me get the sound of the chord changes into my ears. And the more lines like this that I work out, the more likely I’ll be to be able to improvise something like this in a solo. So feel free to play through my licks and practice them, but also come up with some of your own. I honestly feel that this two-bar chord progression is the key to unlocking Giant Steps. Once you can improvise over this tricky chord sequence, the rest of the progression is easy, dare I say it. It’s just a sequence of II – V – I’s in three different keys. Eb major, G major and B major. Playing on II – V – I’s is a jazz musicians bread and butter. There are hundreds of lessons and videos out there about playing on them. Some jazz tunes are so iconic that every jazz musician and enthusiast should know them. John Coltrane’s Giant Steps definitely falls into that category. The chord changes have made it iconic, because they’re notoriously difficult to improvise on. Over the years it’s become a kind of rite of passage for aspiring jazz musicians to learn to play on those changes. I’ll do a more complete analysis of how I approach playing on Giant Steps next week. But the purpose of this video is to show how I approach practising any tricky piece like this. The first and most important thing when approaching any difficult repertoire is to start slow. If you want to be able to play fast, then practice slow. When I’m approaching any chord progression, I’m trying to internalise the sound of the changes. It’s much harder to do this if the changes are flying past at 300bpm. Coltrane may have played Giant Steps blisteringly fast, but I’d be willing to bet that he practiced it slowly first. I love practicing playing over slow changes. You can really enjoy playing over each chord and having loads of time to hear the changes go past. And this will really help you to get the sound of the changes into your ears. Another piece of advice I would offer, is to practice playing the changes over as many different feels as you can. As you can hear in my video I start by using a slow straight 1/16th note feel, and then move on to a faster swing feel. But that only scratches the surface, there are so many different tempos and feels that you can use. It always amazes me that some jazz musicians seem to only practice improvising in a swing feel. You can always tell who these people are because they instantly sound very uncomfortable playing in anything that doesn’t have a swing feel. Giant Steps was recorded and released in 1959, which was a watershed year in jazz for many reasons. It came from the album which was also called Giant Steps, and that album is seen by many as a masterpiece of jazz Bop style improvisation and composition. In fact it’s seen by many as the ultimate recording in that style of jazz. You can find my bass TAB and analysis of a John Coltrane lick from that album here. It comes from a composition called Countdown which features similar chord movement to Giant Steps. It’s certainly possible to believe that Coltrane himself believed that he couldn’t improve upon Giant Steps. Because from that point on in his career he went on to explore other aspects of jazz improvisation such as modal jazz and free jazz. And he never returned to the Bop style vocabulary of the Giant Steps album.